Historically farmers have started nutrition input programmes (along with anthelmintic drench, B12 etc) for lambs after weaning. We have been able to demonstrate that inputs in the period prior to weaning have a profound impact on immediate post weaning growth rate and yield – a difference that remained throughout the autumn. Interestingly, the prototype of this product caught the attention of meat company staff because lambs from the five unrelated properties had one stand out thing in common; lambs were killing out heavier than that target range they had been drafted to meet. On many properties this has also influenced weaning weight though this is conditional on feed supply not being limiting (hence climate). Normally we start working on lamb performance after weaning. 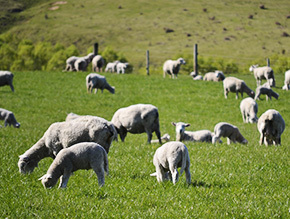 This misses the opportunity to gain from increased performance prior to weaning or setting lambs up for greater immediate post weaning performance. NUGGETS, which is used during this critical pre-weaning period, starting as soon as the miss-mothering danger is over, is designed to produce higher yielding lambs drafted earlier. Lambs doing better from a very early age > eat more and grow faster > compete better > heavier at weaning > higher intakes and growth rates after weaning. Mineral reserves > minimal weaning stress > less weight loss > drafting again 10 days after weaning > more away in first post weaning draft. Lamb kill brought forward > best feed now available for 3rd tier lambs > higher growth rates in 3rd tier lambs > higher drafting ratio > feed available for other stock. Our trial results indicate treated lambs are one percentage unit higher yielding (e.g.45% - 46%), will be doing better and will be less effected by weaning. The yield difference was consistent throughout the whole finishing season in spite of treatment finishing at weaning. This translates into drafting earlier (including a pre-weaning/weaning draft), drafting to a lower liveweight threshold, drafting sooner after weaning and drafting at shorter intervals. The difference in carcass yield (+0.2kg to +0.5kg for any given on farm drafting liveweight) and average kill date (+3 to +13 days) appears to be closely linked to the amount of product consumed. As consumption per lamb went up so did the benefit. Whilst the benefits described above have been consistent across all locations, the level of consumption and hence magnitude of benefit differed by farm, and was also a function of how early the product was introduced and for how long the product was made available. A video presentation of this products development since 2003 can be viewed. Weaning is undoubtedly a stressful time which increases the requirement for nutrients, especially vitamins, yet the supply from the rumen is typically reduced. Changing diets, especially when it is onto brassica crops, can give rumen microbes a setback – it takes time for them to transition and often vitamin production is impaired during this time. The impact of this is greatest when the two diets are contrasting in digestibility and effective fibre. Examples: summer dry to summer crop, or from high country pasture to crop. The design of QUICKSHIFT aims to cover for this interruption, ensure energy metabolism is unaffected, stimulate rumen microbes and ensure appetite is maintained. It is drenched at weaning or at the time of a feed change.